In this Hanzo Build Guide, we provide an overview of his strengths, abilities, talents and matchups. Hanzo is a ranged Assassin with a kit that has largely been left intact from Overwatch. Fortunately for Hanzo, unlike in Overwatch, he isn’t a liability in Heroes of the Storm. In fact, he’s quite the effective assassin. Falling somewhere between Genji and Valla, he’s a potent ranged threat that brings both damage and utility. While he lacks hard crowd control outside of his Heroic, he makes up for this with high impact damage (thanks to Storm Bow) alongside area pressure in Scatter Arrow. His Sonic Arrow also proves particularly useful, especially on objective based Battlegrounds which require interaction. While it’s a little too early to make suggestions as to whether or not Hanzo will be a top-tier pick, there’s no mistaking that he’s fun and serves as an adequate draft if Valla isn’t available. A well placed Dragonstrike can comfortably wipe a low health team, while Natural Agility offers him an exceptional tool for escaping (even if its cooldown is fairly lengthy). As long as you remain on the fringes of any team fight, while keeping vision available, Hanzo can comfortably pressure any opposition. Natural Agility (Trait) - Natural Agility acts similarly to Genji’s Cyber Agility, with the exception that it has a longer cooldown, and can ONLY jump over unpathable terrain. While that might not seem instantly strong, it allows Hanzo to dive structures to snag a kill, or retreat where the enemy can’t. Considering its cooldown is lengthy, and as his only form of mobility, it’s important not to waste Natural Agility. Use it when under pressure, or to secure a kill against an enemy who’s attempting to escape. Just be conscious of the fact you have to physically leap over something to activate the Trait. Storm Bow (Q) - Storm Bow provides Hanzo with a powerful long ranged attack that he can charge while he moves. While it only hits the first target it comes into contact with, its range combined with burst ensures if he does position himself correctly, he can deliver high damage. Ideally you want to position yourself on the edges of any fight with Storm Bow to ensure you have any sight lines. In addition, with its low cooldown and cheap mana cost, you should be using it as often as possible in order to soften up the opposition. Scatter Arrow (W) - Scatter Arrow is challenging to use, simply because it needs the player to read the angle of trajectory, and where the bounced arrows will hit. While Scatter Arrow deals low damage if you simply hit an enemy Hero, it won’t split into multiple. You have to use scenery in order for it to scatter, so it’s important to not only be in range of something to reflect arrows off, but to also ensure they actually hit your opponents. I really must stress that Scatter Arrow takes a lot of practice, and you can expect to have more “misses” than “hits” with it. That said, in a confined environment it can be incredibly powerful. Sonic Arrow (E) - Allowing Hanzo to grant himself and his team vision of a fixed area, Sonic Arrow acts somewhat similarly to Rexxar’s Flare, or Lunara’s Wisp. The key difference is the fact Sonic Arrow cannot be destroyed, its radius is huge, while it’s capable of dealing damage on impact. Although it has high value in its stickiness (ideally, you want to hit a Hero), the zoned vision remains undeniably good. Used on an objective, it provides a lengthy period of sight for your team. Based on its cooldown, try to always use it as much as possible: it will save you and your team many deaths. Dragonstrike (R) - Dragonstrike is without doubt my preferred Heroic, but one that at times is easily avoided. The obvious casting animation, audio cue and slow travel speed make it somewhat easy to avoid. That said, anyone caught in its wide radius is going to take a high amount of rapid damage. If nothing else, the ability to zone opponents away from an area or finish off those that are low health is partly its primary value. At times, it’s a good idea to launch Dragonstike at point blank range as this leaves little room for enemies to escape. However, be aware that you can be interrupted. Dragon's Arrow (R) - Somewhat similar to Sgt. Hammer’s Blunt Force Gun, Dragon’s Arrow offers some much needed crowd control and AOE damage. Travelling indefinitely until it hits an enemy Hero, the impact stun and damage is fairly high. Short ranged impacts aren’t as fearful as when its been cast from, say, your Core, but it still remains potent from medium ranges. On Battlegrounds that require objective interaction, such as Cursed Hollow, Dragons Arrow can be incredibly valuable. 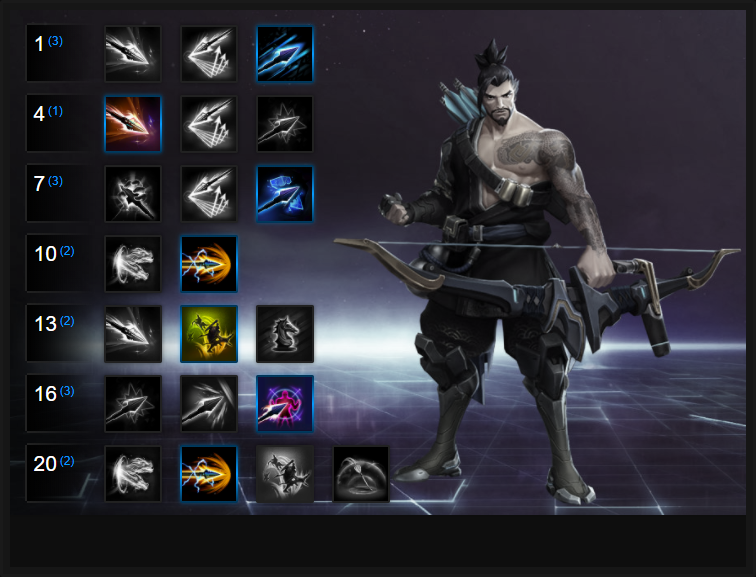 Like our Hanzo build guide? You can help support its updates by subscribing to Ten Ton Hammer. Here's the details. Hanzo has painfully slow basic attacks, so gaining a 50% increased attack speed through Redemption is significant. Every 2 basic attacks against the same Hero grants 1 stack. At 12 stacks, you complete the Quest. Just be aware that when you die, you lose three stacks, even when Redemption is capped. As Hanzo has such poor wave clear, Explosive Arrows allows him to lane fairly easily early game. The high damage AOE from Storm Bow ensures any Heroes attempting to use minions as body-blocks can still suffer damage, while it significant improves your wave clear. Allowing Hanzo to lower the armor of any target he hits with a basic attack, Sharpened Arrowheads allows him to pressure a single target quickly and easily. While the armor debuff isn't huge, it reaches up to 20% allowing him and his team to deal much more damage. Providing burst damage and an AOE stun, Dragon Arrow is amazing. Whether used at long distance, or short range for an immediate explosion, it allows Hanzo and his team to escape or follow-up. The brief stun also allows Hanzo to reliably land Scatter Arrow against multiple foes, while the infinite travel distance is great for disrupting objectives. With your Trait providing your only form of mobility, Ninja Assassin is fairly mandatory. Hitting Heroes with Storm Bow lowers its cooldown by 10 seconds, while a takedown resets it instantly. Giant Slayer allows Hanzo's basic attacks and Scatter Arrow to deal an additional 1.5% damage, based on their maximum health. Considering your attack speed when Redemption is "capped", and your Scatter Arrow constantly being available, it allows Hanzo to deal massive damage. Play of the Game allows for some incredible burst, as it permits Hanzo to teleport to the Dragon's Arrow. Upon impact, he'll leap backwards and deal damage to all those stunned. He can then immediately follow up with Storm Bow and Scatter Arrow for massive AOE damage. Variable: If you're under heavy dive pressure, or being focused constantly, take Perfect Agility. Gaining a second charge of your Trait, while reducing its cooldown by 5 seconds is significant. These Hero Threat Levels (1 being lowest threat and 10 being highest threat) are to help you determine which enemy Heroes can give you a headache. For the Heroes listed here, take extra care as they're particularly dangerous for Hanzo. Falstad: Falstad is challenging for Hanzo because his Barrel Roll combined with Hammerang can punish you near instantly. He also attacks far too fast, and has some self sustain through talents. Illidan: He can kill you incredibly fast but if you keep him snared and use Vault, you can usually win when you attack first. Kerrigan: As long as you avoid her pull, she really has too few methods of escape to avoid your damage output. Despite that, if she does get the jump on you, you're in trouble. The Butcher: His self healing, Lamb to the Slaughter ultimate and his charge make him a real threat. Be very careful if he's on the enemy team. Thrall: Similarly to The Butcher, Thrall's root combined with his ranged poke, self healing and Wind Fury make him very dangerous if he catches you. Zeratul: His cloak, opening burst, slow and Void Prison (should he use it 1 on 1) make him a huge threat, especially if you're laning by yourself. 1. The only use your Trait has is to leap over unpathable terrain. If nothing else, using it in this manner ensures an enemy cannot follow you. Only the likes of Falstad, who can Barrel Roll across similar terrain, remain a threat. 2. Save Natural Agility for when under serious pressure. Ideally, you also want to position yourself near terrain that you can instantly leap over when you're under attack. 3. I'm unsure if this is a bug, but I've found Storm Bow can travel over some objects that projectiles would typically stop at (such as small structures and trees). 4. Pressing Q once will charge Storm Bow and its range. You don't have to keep it held down. 5. Holding Storm Bow doesn't increase its damage, only its range. 6. Storm Bow will impact on minions and mercenaries: any enemy it hits first (so try to position yourself so you can hit Heroes). 7. Ideally, have one Storm Bow armed and ready when entering into a team fight for an early volley of damage. You can then release a second not long after. 8. Scatter Arrow displays the ricochet angle of the arrows fired. Try not to rush the shot, it doesn't have a low cooldown and you want to ensure you can hit as many enemies as possible. 9. Until you get Explosive Arrows, use Scatter Arrows on a minion wave to soften them up, especially if solo laning. 10. By all means use Scatter Arrow 1 on 1 if it secures a kill (simply hitting a Hero directly does low damage to them), just be aware the real potency is in its AOE potential. 11. Always, always use Sonic Arrow. Treat it as you would Lunara's Wisp. It should rarely be off cooldown, and you want to constantly use it on bushes, vents and objectives. 12. Landing Sonic Arrow on an enemy Hero is good, but don't feel pressure in attempting to snag someone with it. Just gaining the vision is its core component: tagging a Hero is just a bonus. 13. Try to cast Sonic Arrow where you think the enemy will be, preferrably at the periphery of your vision radius. That way, you massively extend your potential sight line. 14. Dragonstrike takes over 1.5 seconds to cast, and moves slowly. Ideally you want enemies to suffer the bonus central damage, so be sure to aim for where you think your opponents will move to. 15. It's sometimes a good idea to reposition with Natural Agility, find cover in a bush or vent, and then use Dragonstrike. If the enemy can't see you, it's a good surprise attack. 16. Hanzo has painfully slow basic attacks. He can't go toe-to-toe with most basic attack Heroes as they'll cut him down far too quickly: use his range. Thanks for reading our Hanzo guide! You can now help support Ten Ton Hammer, so we can keep writing guides like this. Thanks for reading our Hanzo build guide. You can help support its updates by subscribing to Ten Ton Hammer. Here's the details.